Proudly serving the Venice, Sarasota, and Bradenton area for over 39 Years! Venice Shutters offers free in-home window treatment consultations and estimates. We bring samples to your home or just stop by one of our beautiful showrooms. We help customers make smart choices in color, style, and function. We have name brand products for any budget, with our huge volume we will save you money. Serving Manatee & Sarasota counties since 1979..
Customers seeking the highest level of control over the light entering their home should consider blinds. What’s great about blinds is that they can be raised to expose the entire window or lowered and adjusted when the sun is brightest. 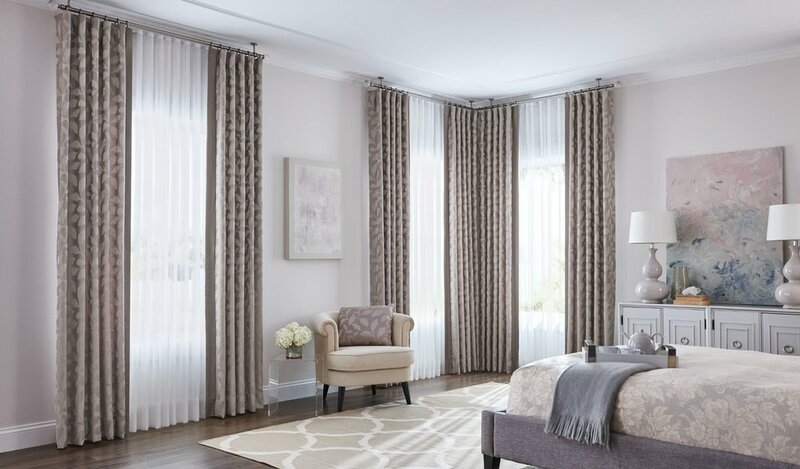 If you’d like a window treatment that allows you to completely shut daylight out from your home, drapery offers that and more with a level of stylish sophistication that’s unmatched in the window treatment industry. For a window treatment with elegant adjustability and clean lines, shutters are the clear choice. If the room in question has wooden furniture, we can match the wood’s stain and grain to help you achieve a uniform look. Venice Shutters Décor & Designs is a window treatment business with two showroom locations in Bradenton and Venice. Serving Florida’s Gulf Coast residents for more than 35 years, our knowledgeable staff can help you achieve the ideal balance of shade and natural light in every room of your home. Visit either of our showrooms and you’ll find an excellent selection of blinds, shutters, drapes, and shades; each offering their own style and luminous benefits. We have a large inventory of spare parts and accessories which we use to do all kinds of repairs. After more than 36 years in the window treatment business, we’re confident that our sales and installation prices will meet or beat those of the competition. Our installation technicians are knowledgeable in all aspects of the installation process and each of the window treatment products we carry. We look forward to providing you with a quality installation that leaves you completely satisfied and eager to hire us again! From the moment you first call to the day we finish your project, you’ll be amazed by our staff’s dedication and attention to detail. Both your decorating consultant and installation technician will have deep product knowledge and a keen eye for style to provide you with unparalleled level of service. Call today to speak with a member of our team and schedule a free on-site consultation.